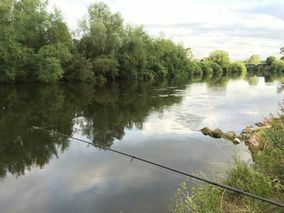 The fishery consists of double and single bank fishing, above and below Hoarwithy Bridge, along approximately 0.75 miles of the Wye, and is now available by arrangement for Coarse, Pike and Salmon angling. It has historically been very lightly fished. The fishery regularly produces good catches of Barbel, Chub, and Dace, plus increasingly Roach and Perch. There is a limit of 5 rods on the fishery at any one time, with the day rate set at £18 per angler with a one rod limit per angler. Children under 16 can fish for free provided they are accompanied by a paying adult. The whole fishery can be exclusively booked for £75. This is limited to between 1st November to the 1st February at a day rate of £25 per angler with a limit of two anglers and a one rod per angler rule. The beat has been in the same family ownership for many years, and was historically a prolific water considering the lack of fishing pressure from family and friends. It has only been fished sporadically for Salmon in recent times and the occasionally recorded fish cannot reflect the potential of the fishery. Aimed at keen and experienced Salmon fishermen, and subject to availability, an allocated, regular weekly day for the whole beat, during the Spring period March 3rd to 15th June 2019 (equivalent to c14 days), for a rod plus guest. For the remainder of the season, day rods are available at £20 per day. weekend at the Old Harp Fishery in 1933. Their weights were 26lb, 25lb, 24lb, 18lb and 16lb.